From that description, you’d think the narrator was referring to someone with a short lifespan, but nothing could be farther from the truth. Adaline has five locks on her door. Not very trusting for an immortal. In a later scene I did a recount and I think there might actually be six locks on her front door. But who’s counting? Here’s the element that makes this a sci-fi story. It’s hokey, but no more so than the conceits behind The Curious Case of Benjamin Button (2008) or The Time Traveler’s Wife (2009), etc. “Since I Don’t Have You” by #TheSkyliners. My dad’s favorite song. Ellis should quit while he’s behind. But he doesn’t. And so the story continues. “Jenny kissed me.” Not familiar with that poem. But then, I’m not a know-it-all. Truth be told, my knowledge of poetry is next to nil. Guess that means it’s time for me to take a rhyming pill. Ellis keeps sticking his hand where it doesn’t belong. A dangerous habit for a professional painter. Turns out Ellis isn’t a professional painter after all, he was just painting his flat. But to be honest, I’m not really sure what he does for a living. Seems like Ellis is a jack-of-all-trades sort. “I don’t like having my photo taken.” And with good reason. I don’t like having my photo taken either, but not for the same reasons as immortal Adaline...obviously. But sometimes jokes are so dumb they’re actually funny. Such is the case here, much to Ellis’ relief. Adaline has a pet photo album. Her priority is pets over people. The curse of immortality. While pets have a shorter lifespan than humans, you don’t have to worry about them learning your secret. Plus, you can take them with you when it’s time to reinvent yourself in a new area. An indoor, outdoor theater. Fascinating! Placing the luminescent stars on the ceiling is a nice touch and certainly enhances the overall mood. Ellis says Jenny has nine lives. Not far off the mark. Scenes like this should come as no surprise, but sometimes the mind drifts to Indy and Han and we forget what a tremendously talented performer Ford really is. “It was fleeting, inconsequential.” Nice cover. I mean, he named a comet after her for crying out loud. Never challenge an immortal to a game of #TrivialPursuit. Kiss your winning streak goodbye, William. A really good scene. Superbly performed and rife with meaning. “You’ve lived, but you’ve never had a life.” The price of immortality. You can never live up to your fullest potential if you’re always looking over your shoulder. “My name isn’t Jenny.” The cat’s about to come out of the bag. I was hoping she wouldn’t spill the beans here, but if she hadn’t, the movie would’ve run at least another half hour. First gray hair...normally not a cause for celebration. Unless you haven’t aged a day in over 100 years. I was less than thrilled when I plucked my first gray, but then again, I’m a vain man. Final analysis: a thoughtful examination of mortality and the human experience. Shades of #ForeverYoung and #TheCuriousCaseOfBenjaminButton, but with its own unique twist. By featuring main characters who, in some regard, exist apart from the normal flow of time, these types of films make us stop and take a long, hard look at our lives. By identifying with these characters, we gain an outsider’s perspective on our own lives, which reminds us just how precious a commodity time really is. Rating: 2 1/2 out of 4. A farcical romance with Sci-Fi trappings. Has a message, but is fairly unmoving. So the basic premise here, a woman achieves immortality after drowning in freezing water and being resuscitated by a well placed, well timed lightning bolt, is as unbelievable as they come; a story right out of a classic sci-fi pulp digest. 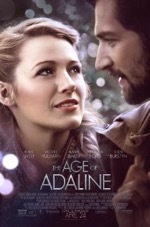 The narrated narrative itself, which spans a century, reveals the plight of Adaline Bowman (Blake Lively) as she moves through time without aging and without making any serious connections with people for fear of growing too close to someone that she’ll have to run away from when her wrinkle free skin betrays her to aging “contemporaries.” The movie’s inciting incident occurs when Adaline unwittingly falls in love with Ellis (Michiel Huisman), a relationship she knows is ill-fated from the outset but is helpless to resist. Further complicating the story is the “meet the parents” scene where Ellis’ father, William (Harrison Ford), recognizes Adaline from the past. As a one-time lover of Adaline’s, William’s random reunion with the ageless woman explodes the implications of the story. The movie splits its time between four genres: Drama, History, Romance and Sci-fi. In many respects, the story feels like it was written by Nicholas Sparks, which screenwriters J. Mills Goodloe and Salvador Paskowitz should take as a compliment. The sci-fi elements are of the softer variety, resembling the works of Fitzgerald more than those of Wells. The former wrote the story-turned-movie The Curious Case of Benjamin Button (2008), a tale about a man who ages backwards. Here, the title character maintains a normal temporal trajectory, but will forever remain untouched by the ravages of time. The period elements are extremely well done and have attained the appropriate degree of authenticity to keep us engaged in the story’s fantasy. The acting is also superb. Ford’s portrait of a man yearning for the past and pining over the life that might have been is truly exceptional, and Kathy Baker, as Ford’s jealous wife, is also terrific in an ancillary role. Lively delivers a genuine, understated performance that very easily could’ve ended up being mawkish in the hands of a less skilled actor. At times, Lively’s Adaline seems detached or aloof. Such muted emotions are not only appropriate, but are keen observances of human behavior since an ageless woman would learn very quickly how to suppress her feelings in order to protect her identity as well as safeguard against over-investing in the lives of mere mortals. In the end, this film won’t set the world on fire, but it’s an intriguing examination of the human condition with respect to our perception of time and our own mortality. The underlying question “What good’s immortality if you can’t even enjoy it?” permeates this bittersweet tale. Fans of Sparks style decade-spanning romances should find the film heartfelt and emotionally satisfying. Those who appreciate finely mounted slice-of-life stories should also enjoy the film. But those who would prefer that sci-fi elements be kept out of their down-to-earth dramas might feel left out in the cold. Can’t believe it’s been well over a year since his passing. How bitterly ironic that it was a car accident that took him from us. “You can’t outrun the past.” Unless you have a really fast car. That’s equipped with a flux capacitor. “An open road helps you think.” Conversely, heavy traffic constricts thinking. Or worse yet, fuels #RoadRage. Who brings a sledgehammer to a cemetery? And what good would it do to shatter a headstone anyway? The family would still know where the grave is and public records would have an accurate record of who’s buried in the plot. Strange motivation. Amazing fight scene at the PD. A real backbreaker. A friend of mine (a female mega fan of Johnson’s) says The Rock’s physique is too big now. Opinions? “No more funerals.” In an action movie? Not likely. Of course, we’re tricked into thinking that one of the main characters will die, but…psyche! This just shows how insanely macho Diesel and Statham’s characters are. However, it’s this excess of testosterone that makes for a thrilling showdown at movie’s end. God’s Eye. The Patriot Act on speed. A quote that perfectly captures this movie’s fly-by-the-seat-of-your-pants plot. If you allow yourself to get lost in this sequence, it’s quite an adrenaline rush. “Touchdown, baby.” And we’re not talking about football. “You might want to put on your helmet for this one.” A fitting slogan for the entire movie. Make sure your seatbelt is snug too. 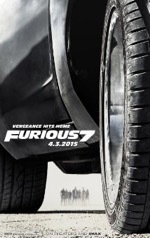 Tyrese Gibson is this film’s comic relief and is quite effective in his role. One of the only redeeming aspects of these characters is how they look out for each other as if they were a biological family. The #Goldfinger dancers are a bit much. However, this is an action movie, and they are in Dubai. Game of Chicken 2.0. Just as destructive as the first. With a twist at the end. It’s all about getting the upper hand. A great line taken right out of Schwarzenegger’s playbook. “The street always wins.” Good line. And the street always extracts its price in blood. Final analysis: amazing action sequences compensate for the movie’s shallow characterizations. The touchy feely sequence at the beach doesn’t make up for the dearth of character development throughout the rest of the movie. Rating: 3 out of 4 stars. The touching tribute to #PaulWalker at movie’s end puts it over the top. Iron Man needs to watch his language. According to Captain America—the Avengers’ Arbiter of Appropriateness. “Send out the twins.” Olsen or Wonder? An inside joke since the Olsen’s sister, Elizabeth, plays the Scarlet Witch in this film. Hulk deals with the bunker. Perfect man for the job. The not-so-Jolly-Green-Giant runs right through it as if it was made of balsa wood, never breaking his stride. An impressive visual. “He’s fast and she’s weird.” Ha! Quite a pair these wonder twins. But where’s the monkey? Oh wait, that’s from the other comic book universe. “Will Thor be there?” Women everywhere are thinking the same thing. A suit of armor around the world. Interesting concept...and wholly improbable. An extremely daft idea by Stark. His motivation here strains credulity, much like the plot itself. #StanLee sighting in a bar. #Excelsior! Trying to lift Thor’s Hammer scene is hilarious. Echoes of #TheSwordInTheStone. The latter is a quote from Star Trek: TNG’s “The Arsenal of Freedom.” The former is reminiscent of General Chang’s (Christopher Plummer) line “No peace in our time” in Star Trek VI: The Undiscovered Country (1991). A Trek double dip. No extra charge. “The geometry of belief.” Ultron sets himself up on a throne. Recruits two disciples. Shades of the antichrist sitting on a throne in the rebuilt temple in the Bible’s book of Revelation. #AndySerkis is nearly unrecognizable here. Strange to see him out of a CG guise. A nice bit of surprise casting. The “mind games” visions contain some fascinating character moments. These vignettes serve as the only significant source of character development for many of the characters in the film. Code Green turns into a Code Red. They should’ve left someone behind to keep an eye on “angry” Banner. Safe house. Something tells me it won’t be for long. In action movies, the characters can’t sit around the campfire singing “Kum Ba Yah” for too long. Graduation then sterilization. Sad story. This scene contains some good character background for Black Widow. It’s the first time in two movies that I actually felt like I learned something about her character and felt sympathetic toward her. “Multiplying faster than a Catholic rabbit.” Hilarious! Or tribbles in a grain bin. Kinda’ like this movie’s runaway elevated train sequence, which is conceptually similar to the one in Spider-Man 2 (2004). Downey Jr.’s comedic timing is impeccable. “I can choke the life out of you without changing a shade.” Great line! My favorite line in the movie, zucchinis not withstanding. Amazing how eloquent Banner can be compared to his alter ego. The new guy hands Thor his hammer. Woah! Does that mean this guy (my comics buddy tells me his name is Vision) is worthy of ruling Asgard? “It’s about whether he’s right.” Interesting point. The story flirts with relevance here. I hear mangos are best for sweetening up vibranium’s bitter aftertaste. A poetic line brilliantly delivered by Spader, who was the perfect choice to voice the titular villain. “If you step out that door, you’re an Avenger.” Nice moment. This scene stands out as the only instance where my emotions were engaged during the entire film. “Ooo, do you kiss your mother with that mouth?” Way to turn the tables, Fury. Again, the incisive dialog written for Downey Jr. is perfectly suited to his talents. An interesting story twist since one AI wants to wipe out the human race because of its flaws and another AI wants to preserve humans because of their flaws. Banner might swim to Fiji. Just as long as it isn’t Tahiti. Reference: Marvel’s Agents of S.H.I.E.L.D. Final analysis: a decent follow up to the first film with new heroes and villain and action aplenty. Rating: 2 1/2 out of 4. Overstuffed with action to the point that I need to see it again. Darn it. 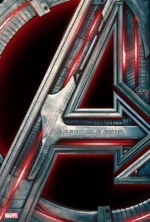 Overstuffed is the operative word when describing these Avengers films. They’re chock-full of colorful characters (in colorful costumes) and mind-blowing action sequences. The one thing these movies aren’t overstuffed with, however, is plot. Of course, the Avengers films are exemplars of the summer blockbuster, designed to entertain a mass audience and extract a price from them so as to ensure the release of the next big blockbuster. Filling the role of cinematic roller coaster, these films are breezy, twisty thrill rides that typically place an emphasis on action before story (and just like with a coaster’s ups and downs, the only function of the brief character moments is to bring us to the top of the next peak so that we can take a plunge into yet another exhilarating, gravity defying action progression). In an effort to be fair to the film’s creative elements, I’m not even going to address the top-notch directing, acting, VFX, etc, in my assessment of the film. What ails this sequel is its “everything including the kitchen sink” story. Like its predecessor, there’s enough story in Ultron to fill two to three movies. Likewise, there are enough plot holes and leaps of logic here to fill two to three movies as well. First of all, Ultron’s transformation to the dark side is so quick it gave me a whiplash. Also, Stark’s decision to create Ultron in the first place seems rushed and foolhardy…and extremely contrived since the story sits in idle until the villain is introduced. No one can say that Stark’s heart isn’t in the right place (well, actually…) in attempting to defend the Earth from intergalactic invaders, but has he so quickly forgotten the Iron Monger tragedy in Iron Man (2008)? Obadiah Stane (Jeff Bridges) used Stark’s technology against him in a clear evocation of the 9-11 tragedy. Here, Ultron uses our own planet against us in a unique twist on the WTC and Pentagon terror strikes. 9-11 symbolism is also evinced in the scene where Iron Man shoves Hulk downward through a building, forming a cloud of smoke and debris on the city streets below that’s eerily reminiscent to what we witnessed on that fateful day back in 2001. Whedon certainly isn’t the first superhero film director to create such visual echoes in his films: Christopher Nolan employed 9-11 imagery in each of his Batman films. Another visual motif, which has been repeated ad nauseam in recent superhero movies, is the giant landmass used as WMD set piece. In Superman Returns (2006), Lex Luthor’s (Kevin Spacey) grand scheme was to drop a gigantic, crystalline mass into the Atlantic Ocean, which would wipe out a large portion of the Eastern seaboard with the resultant tsunami. More recently, in X-Men: Days of Future Past (2014), villainous Magneto airlifts an entire stadium, which creates maximum destruction and mass casualties (and speaking of DOFP, that film featured Evan Peters as Quicksilver, but Aaron Taylor-Johnson plays him here, which is more than a little confusing at first). In this film, Ultron elevates a large section of an Eastern European village with the intention of dropping it like a meteor from the sky, causing an extinction level event on our planet. For the next film, let’s hope Whedon can come up with a more original threat than this tedious and tired story device. As for everyone’s favorite green giant, Hulk is completely underserved in this film. Not only is Hulk sidelined for much of the action, but he’s purposely constrained from doing what he does best—smash things. The only time Hulk really lets loose in this movie is when he goes on a rampage in a city filled with innocent bystanders. This attempt at generating character complexity falls flat and actually diverts us from the main story. Hulk’s contribution to the team during its many melees is negligible at best, which is a massive disappointment. Note to Whedon: in the next film, release the shackles and set Hulk free to fulfill his function on the team (and some character development wouldn’t hurt either). Another disappointment here is the absence of Clark Gregg as Agent Coulson (star of the hit TV show Marvel’s Agents of S.H.I.E.L.D and prominent side character in the Marvel stable of films) and Gwyneth Paltrow as Pepper Potts (who is mentioned several times, but never materializes onscreen). Of the ancillary characters actually featured in this film, Stellan Skarsgard’s Erik Selvig appears in only one scene…what a waste of an incredible talent. All is not lost, however, as there are a few good character moments in the movie, like when Black Widow opens up about her tragic past and when the team seeks refuge at Hawkeye’s house. But these heartfelt, human segues are few and far between amid the onslaught of confrontations. In the end, if you liked the first film, you’ll probably like this one too. The corollary holds true for those less impressed by the franchise. As overstuffed as the plot is, it all somehow manages to cohere. When all is said and done, kudos goes to Whedon, not for his creative genius in realizing the movie’s many action scenes, but for fitting them all into a canny, wieldy tapestry. He’s a master at keeping all the plates spinning at the same time. Let’s hope they don’t all come crashing down like chunks of a European village in the next film. Not quite. But certainly a unique entry into the genre. Nothing new here…everyone wants a piece of success. “Follow the river.” In which direction? Pretty vague directions when dropping someone off in the middle of the wilderness. Key card photo. Can I get a retake? Remember that frightened look. You’ll see it again at the end of the film. Gorgeous view from the patio. I can almost smell the pine trees. The lab is situated in a remote region of a forest. Not only is the compound isolated, its tight, spare and windowless interiors lend it an institutional feel. Good thing Caleb doesn’t have claustrophobia. Nathan wants Caleb to get past the “freaked out” stage. Caleb should listen to his anxiety. Data audit? Don’t sign the contract Caleb. Of course, if he withholds his signature we don’t have a movie. The Turing Test. Baptism of fire. “Who’s Turing?” you ask. Reference The Imitation Game (2014). How many computer nerds wouldn’t get a #Ghostbusters reference? Especially since Caleb holds his own during the Trek talk later in the movie. I chalk this up as a nitpick. Ava turns the tables on Caleb, grills him with questions. Be careful, Caleb. Nathan is listening. “You shouldn’t trust anything he says.” Now we have a story. Of course, everyone in the audience knows Nathan is full of it even before Caleb conducts his first session with Ava, so not much of a surprise. Hacking the world’s cell phones. A map of how people think. Fascinating! You’d find Data hanging out on the other side of the intersection, except he’d be engaged in small talk with passersby (TNG’s “Starship Mine”). Ava plays dress up for Caleb. She looks kinda #PlainJane now. Darn it! No more “curve” appeal. “Engage intellect.” The discussion on #JacksonPollock and #StarTrek is intriguing. Nathan’s Pollock painting does look like something Data would hang in his quarters. Ava asks some tough questions for an AI. Be very wary, young Caleb. “Ava’s body’s a good one.” Uh, yeah! Hopefully there aren’t any minors in the audience since this is a Rated R movie (the fact that I’m bring this up reveals my distrust of parental “wisdom” in bringing younger kids to see such films), but just as a precaution: #FullFrontal. Ava gives herself a physical upgrade. Thank God she put all the right parts in the right places. Final analysis: an intriguing premise that asks some important questions about the essence of existence. Rating: 3 out of 4. The Shakespearean ending is a miss, but the rest is a salient examination of sentience. Deus ex machina is a Latin term that means “god from the machine.” The technique, which introduces a new character at the end of a story that swoops in and miraculously solves all of the problems, was employed by playwrights during Greek theater’s nascent period. Over time, the writing device fell out of favor and is now considered a universal no-no. In the new movie, which tellingly leaves out the deus (god) part of the title, we find a twist on the much impugned story device—we know who the agent of change is early on in the story, but how that character plays into the film’s climactic events is very much in question until the very end. The story here isn’t earth-shattering: A wealthy tech mogul lures a bright young computer nerd (under false pretenses) into conducting a Turing test on his latest android, who just happens to look like a supermodel. What works here is the examination—through the eyes of a machine—of what it means to be human. The mental chess match between Ava (Alicia Vikander) and Caleb (Domhnall Gleeson) is intriguing, and some complex emotional and psychological subjects are broached, such as: friendship, trust, sexuality and, of course, the essence of sentience. Another successful aspect of the film is its skillful thematic layering: the juxtapositions between the open spaces of the surrounding forest and the cloistered confines of the sterile lab, biological and mechanical beings and even good and bad people are all expertly woven into the movie’s narrative tapestry. The isolation from civilization and claustrophobia inside the compound both serve to enhance the film’s melancholic mood and are symbolic of how each of the characters is, in his/its own way, physically or mentally trapped. Lots of food for thought here, which makes the movie a joy watch. The small cast also suits the static, minimalist story. Each of the performers does fine work, but the lack of star power here (Oscar Isaac isn’t quite a household name yet, but will be come December) is one of the movie’s only drawbacks. The main problem with the film is its ending, which squanders a promising premise and solid setup with a predictable, even telegraphed, resolution that’s right out of Macbeth. In the end, Ex Machina is a stylish, thought provoking sci-fi yarn that should stand the test of time—well, at least until the androids take over and eradicate any trace of human existence.